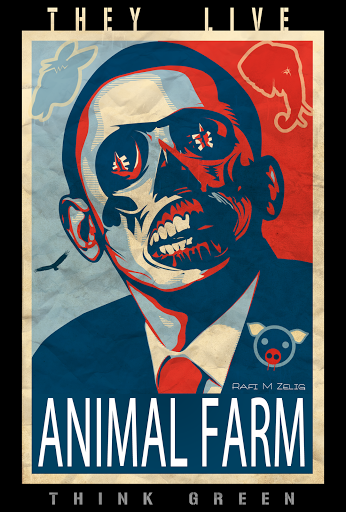 Home › Big Brother › ‘Animal Farm’, a classic novel about Socialists changing the meanings of things, is really about Capitalism…so say the Socialists. ‘Animal Farm’, a classic novel about Socialists changing the meanings of things, is really about Capitalism…so say the Socialists. Author’s Note: A free version of “Animal Farm” can be found here. Please. Read it. It’s only 53 pages. It is the world you live in. Open your eyes. You know there is a new rip in the time space fabric of the universe when modern Socialists change the meaning of a classic book by George Orwell that warned us that Socialists pursue their socialism by changing what things mean. Soon the pigs began changing the commandments. For example, commandment 4 is changed to forbid not beds, but beds with sheets. Some animals realize the commandments are being changed. This commandment is changed when the pigs begin to live in the house. It is significant both because they are re-writing history and because they are beginning to set themselves apart from the other animals and act more human. Another commandment that the animals “ remembered wrong” (ch 8), meaning it was changed, was commandment 5. It is changed to say that animals cannot drink alcohol “to excess” after the pigs begin to like it. Commandment 6 is changed to add “without cause” (ch 8) so the pigs can kill animals that disagree with them. Finally, commandment 7 is changed. BUT SOME ANIMALS ARE MORE EQUAL THAN OTHERS (ch 10). Hey. America. Obama says everyone is equal, but some are more equal than others, and he will decide who. Hey. America. MSNBC says that a book about how Socialists re-write the law, and re-write history, and change what things means, in order to consolidate power and strip you of your freedom, is really about Capitalism, not about Socialism. Hey. America. Is that the change you were looking for? Is that the change you can believe in?